A new guide designed for those travellers interested in discovering the history, culture and nature of the country they are visiting. This book differs from other introductions to Lithuania in its broad historical and cultural context and careful selection of important sites and objects. A diverse and copious amount of information is presented in an easily readable style. Not surprisingly, it is written by an art historian, a broad-minded academic and author of many publications in her field, who also happens to be a passionate and observant traveller. The text is well illustrated with numerous beautiful images of buildings, monuments, and landscapes. 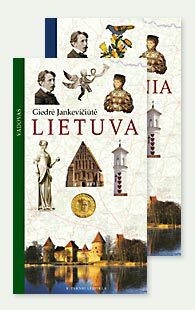 The guide can even be utilised as a valuable correspondence introduction to the interesting sights of Lithuania. 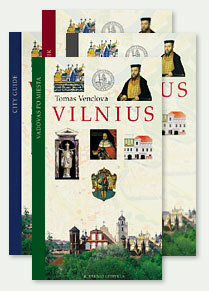 The book's 11 chapters encompass Lithuania's 10 regions, and the city of Vilnius. 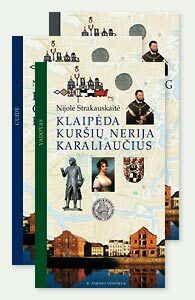 A concise history of Vilnius, Kaunas, Klaipėda, and important facts from the past of other cities and villages provides historical depth to their present-day form. Sections on the national parks of Aukštaitija, Dzūkija, Žemaitija, the Curonian Spit, and the Trakai historical park reveal the diversity of their nature, history, and ethnography. Here you will find descriptions of the most interesting architectural monuments (religious sanctuaries, public buildings, estates, mills and bridges), works of art (sacral paintings, memorials, crosses and chapels), the wonders of nature (parks, lakes, rivers, rocks, hills and trees), museums, historical sites, etc. The guide contains over 1,000 colour illustrations, maps of each region and of the three major cities (Vilnius, Kaunas, Klaipėda), and indexes of described places and personalities. The author takes the reader through Vilnius, pointing out its most important buildings, extant and vanished witnesses of its ancient and fairly recent past, its loveliest spots. The guide is illustrated with 500 present-day and archival photographs, art reproductions, diagrams of architectural ensembles. The location of described sites is marked on a city plan. Awarded the Ministry of Culture prize in a competition of artistic books. A guide through two old cities connected via the history of the creation and flourishing of the State of Lithuania, and the names of its Grand Dukes, Gediminas, Kestutis, and in particular Vytautas. 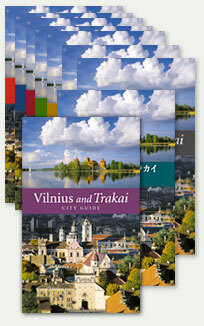 The book refers to the historical streets, most important buildings, and loveliest sites of Vilnius and Trakai. It includes 56 colour photographs, city plans marked with described sites, and practical information for visitors. The ethnic balt lands situated alongside the Curonian Lagoon and known as Lithuania Minor, are now divided among three countries: Klaipėda Region is in Lithuania, Goldap District in Poland, and Kaliningrad Region in the Russian enclave. This guide refers to the following areas of Lithuania Minor: Kaliningrad, Klaipėda and resort towns along the seaside and on the Curonian Spit. Filled with historical material, and information on cultural and historical monuments, and the wonders of nature, the guide is illustrated with approximately 500 present-day and archival photographs. Described sites are marked on maps of Klaipėda, Kaliningrad, and the Curonian Spit. Included is a map of the Lithuanian portion of Lithuania Minor.